Hadoop is still being put to the test. The benefits of the framework, however, appear to be delivering good arguments in its favor. Results from our Hadoop Survey show that groups are emerging for and against Hadoop. It has advantages and disadvantages depending on the use case, but Hadoop will not go down in history as the cure for all analytic requirements. 40 percent of participants worldwide are Hadoop supporters (i.e. they have projects in production, are in a pilot phase or are planning to use it). They show a clear interest in the technology. 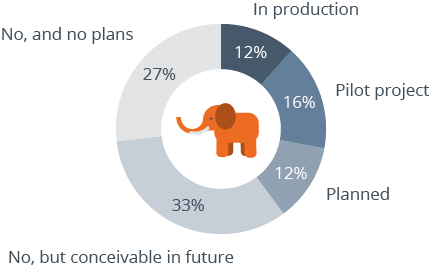 12 percent already have Hadoop in production. Many supporters view Hadoop as a potential component to help build analytic environments for special applications. 27 percent of respondents categorize themselves as Hadoop opponents. Another 34 percent currently do not have Hadoop but can imagine using it in the future.